Look, it's a villain for Dr. Strange to fight, and we didn't even have to resort to HeroClix to make it happen! He gets the flame-head and -hand pieces from so many Human Torches, and is wearing his modern red and purple armor thanks to a new skirt and spiky shoulder pads. The set includes a flight stand, so he can hover above his foes. 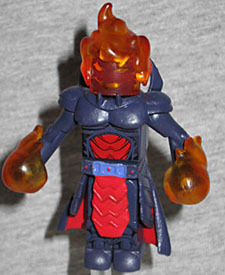 His head is translucent orange, and his face is painted in red. Originally created by a demon in order to lure Dante into a trap, Trish worked side-by-side with him and fell victim to his charms, ultimately betraying the demon world. Now she works together with Dante as his business partner, and wields lightning-based powers. It's a good thing there's a bio on the packaging, because otherwise I'd have no idea who Trish was. Dante I'm familiar with, but as far as I knew, Trish was just some biker chick. She's got leather pants, leather boots, leather bracelets, a leather choker, and a leather bustier. She's a white trash valkyrie straight from the edge of ruin! She's armed with a black pistol and the Sparda sword. What's a Sparda sword, you ask? Well, it's a big, wicked-lookin' scythe thing, what more do you need to know? Pretend it's the Soul Blade for all anyone cares. 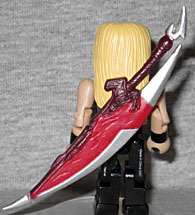 In a nice move, the blade can plug into a hole in her blonde hair, as though she's carrying it on her back. 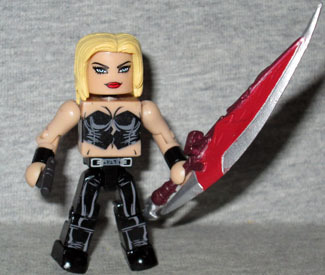 This entry was posted in Art Asylum, Marvel, MMMR and tagged Capcom, Minimates. Bookmark the permalink.